Ideal for use in confined spaces, reach into every corner of a room, under every obstacle for superior cleaning in difficult to reach areas. Design features such as low deck profile and offset enables cleaning next ​walls, under furniture and hard to clean areas. Navigate obstacles easily with the highly manoeuvrable Nilfisk micro scrubber dryers. 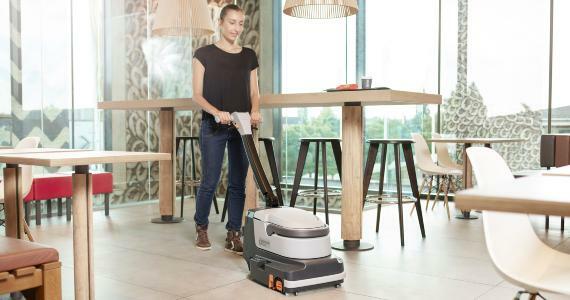 Features such as an ergonomic handle enable effective cleaning in low positions under obstacles such as furniture. ​Thanks to an intelligent assembly system, less screws, springs and more interlocking parts, costs and time for service have been enormously reduced. The removable solution/recovery tanks make it easy for the operator to empty/refill and keep them clean. Tool free maintenance makes changing the squeeges and brushes quick and easy.